Inspiration Planter's Hoe Lucy comes in a Fiskars quality package and a distinctive trendy blue colour. 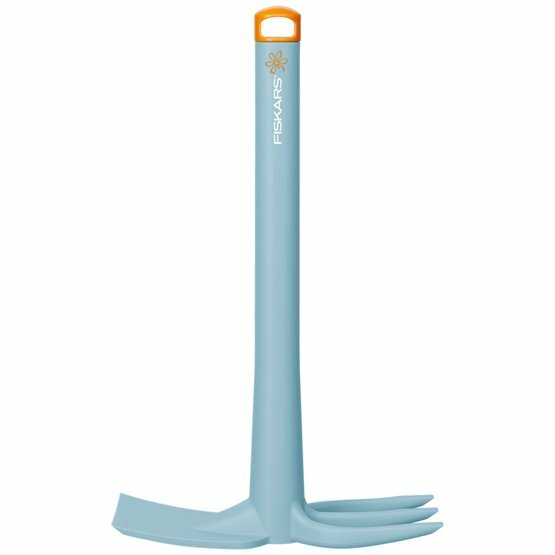 The planter's hoe is an ideal tool for multiple planting and weeding tasks with its long shaft and dual head incorporating both a three prong fork and a hoe edge. The FiberComp™ construction makes the tool extremely lightweight but strong and because the FiberComp™ material does not corrode or age, this tool will be a stylish pleasure for years to come. The prongs of this tool can be sharpened while the hanging hole makes for easy storage. If you are looking for a modern planter, this tool has many advantages.